Sort of like Jackson Browne. I have had an Ipod for several years. But I couldn't make it work in my 10 year old car. For awhile it worked, then it didn't. I needed an new adapter. I thought I was just not savvy enough to make it work. So I loaned it to my son-in-law Eric for a few months to use it for his commute daily to Kansas City. I told him to fill it up with good songs, in case I got better at working it. 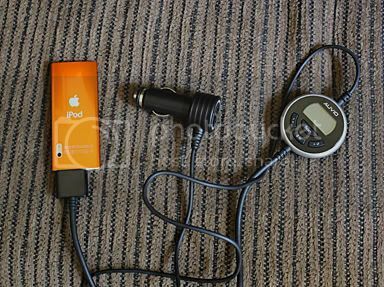 Before I headed on the long drive home, I went to a Radio Shack in Indianapolis and bought a new adapter for my Ipod. I don't know if my own one was broken or what...THIS one worked like a charm. Put one end in the cigarette light and one in the Ipod. Select a radio station. It charges and PLAYS! Bingo! AND it stays with that radio station even when you get out of range. I did not realize the beauty of wonderful music on a 9 hour drive. Oh my... Bliss. This was so fun. Perhaps it was too much fun. After the bad weekend of midwest storms, I was watching the sky and listening to these new songs by my kids band that is kind of reforming into a new band. Long story. Bands do that. Yes, so much fun, that I did not stop at my first six chances for a motel. Unfortunately, I neglected to look at the gas gage. That helpful little Toyota empty light was flashing. I didn't notice it til the clouds broke. Downpour, serious downpour, where cars and semis were pulled up end to end on exit ramps. The sign I remembered last had said, next services, 13 miles. I go into saving gas mode. Yes, I prayed. I counted miles. I tore the Ipod cord from the outlet. I turned off air conditioning. Driving at 45-55 was a benefit. I plunged ahead. And the only song playing in my head was "Running on Empty". It wasn't on Eric's playlist. I made it to the first gas station and by my calculations at the gas pump, I must have had about 4 ounces of gas left. I treated myself to a night at a Hilton Garden Inn. Today the sky was bright with puffy clouds and sunshine. I got my music going, and noticed the overwhelming good hearts and optimism in the songs the new band is working on. I was very happy to cross the line, back into my Kansas.